Do you want to take the cool air wherever you go? The simple way is to own a portable air conditioner, it is an amazing invention that provides you with an easy access to take it with you in any room and enjoy the cool atmosphere. 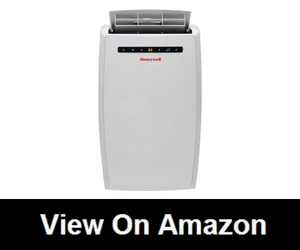 But you will definitely get confused looking at the many and many options out there, wondering what is the best portable air conditioner on the market? You don’t need to worry! We are here to help you choose the best. You can place it at home, office, and shops, as it doesn’t need permanent installation. Let’s have a look at some basic information first. Even in a very hot wheater air conditioner can perform better to provide cooling. Now that you know enough, you are probably thinking of getting one, aren’t you? We have decreased the list of many to a list of top 10 portable air conditioners for 2019, have a look and choose the best companion to beat the heat. After spending hours in research we are able to find the top 10 best portable air conditioners to buy in 2019. The reason this product got on my list is that this is the ideal solution for the warm spots in your home, office or any other high-cooling demand settings. Specifically designed to be mobile and powerful, the Whynter ARC-14S portable air conditioner is one of the best possible options to bring home. The Whynter GREEN ARC-14S portable air conditioner features the eco-friendly CFC free GREEN R-410A refrigerant and lead-free RoHS compliant components. This unit features the patented advance auto drain technology, which uses and recycles moisture collected during the cooling process to produce cool air. Most of the people are impressed with this product because it does pretty much it claims to do. It is easy to assemble and it does cool the space as promised, it also pulls lots of moisture out of the air. Also, it is easier and effortless to transfer it from one place to another, which makes it one of the best portable air conditioner. This unit features an auto-restart function which it automatically restarts on the previous settings after the power outage. The unit can also be programmed with a 24hr timer to activate or shut-off at preset times. Additionally, it also features a separate dehumidifying mode that enables it to be used as a room dehumidifier as needed. A carbon air filter and washable pre-filter are equipped standard on this air conditioner to help keep the cooled air cleaner and fresher. One of the thing that you will love about this model is its powerful motor which has the ability to cool rooms with a size of up to 500 square feet. Whether in a living room or in a small office, this will be an excellent appliance to have. Also, there is no need to have frequent and expensive filter replacements, this is going to be cost-efficient in the long run. The unit is really big and the two air hoses take so much real state on your window. The included activated carbon filter only covers half of the air intake, which doesn’t make much sense. Also, it takes several hours to reach the desired temperature. This product is an amazing choice as it provides high cooling capacity along with a highly portable and compact design. It is a true powerhouse that will cool off a room faster than most of its competitors and it operates quietly. It cools, dehumidiﬁes, and circulates air to stand up to summer heat. Offering immediate, uninterrupted comfort, this Portable Air Conditioner features easy-to-use electronic controls and is quiet while you sleep. This unit comes with rolling casters and side carrying handles for easy-to maneuver mobile comfort and everything needed for an effortless installation. Most of the people are satisfied and happy with this steady and powerful device, the way it effectively keeps the room temperature consistent. With simple controls, a timer and sleep mode, this is an efficient device that is ideal for everyone for any requirement. The vertical motion creates a steady and powerful airflow that provides a consistent temperature in any room in the house. 4 caster wheels included for easy movement and compact portability. The air conditioner can work in the fan mode as well as the cooling mode and even the dehumidifier mode. The maximum length of the exhaust hose is 4 feet and 11 inches; Window kit included for easy installation and a manual guide for setting up. It can easily cool a room of up to 350ft2, this ensures that most of the rooms can be easily covered with the help of this air conditioner. The LED digital displays the temperature settings as well as the mode settings pretty clearly. With the completely silent operation, you can be sure that even you are running it through the night, there would not be any disturbance. Moreover, there is no need to worry about its maintenance, you can easily clean the filter by removing it yourself. The weatherstrips and seals that come with it are cheap and tear easily. The bright blue display lights will illuminate your entire room, you will not be able to keep the room dark at night. Also, the compressor takes a bit of time to turn on. 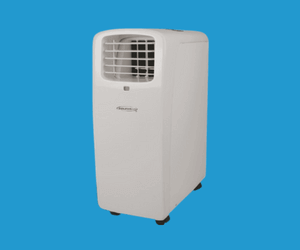 This LG LP0817WSR portable air conditioner offers portable cooling solutions to small rooms that are at most 150 square feet in area, delivering up to 1.8 pints per hour of continuous dehumidification. This allows the occupants of the room to feel a lot more comfortable without necessarily suffocating from excessive moisture that may be present in the air. LG’s portable air conditioner is the ideal climate-control solution for when you’re on the go. With a sleek contemporary design, this free-standing portable unit blends in with any room decor. Our auto-swing air vent technology makes sure you enjoy every bit of cool air by circulating the cool air more efﬁciently so no hot spot will be left untouched. This unit works for pretty much everyone out there, they say it is easy to put together and it cools the room effectively. People also like the remote as it is very easy to use and the air conditioner doesn’t make noise, but some complain that it is a bit noisy. The LG comes with a powerful mechanism that is easily plugged into standard 115-volt electrical outlets with 15 amperes of electric current. It comes with an auto evaporation system that helps ensures the unit will not overheat while also contributing to substantially colder air in the room. Also, the system comes with a programmable 24-hour timer so you can have full control of its cooling efficiency regardless of whether you’re in the room or not. One of the good things is that the unit was designed to fit into everyone’s décor so it has very sleek good looks and doesn’t stand out as much. Another one is that you can easily schedule the air conditioner so you don’t have to think about it all the time, and because it has basically no maintenance required, you don’t have to be concerned about emptying the buckets. It doesn’t have a sleep mode, this means it will probably be louder than you’d like it to be at night. Also, this unit needs to be vented to the outside, so you have to set up the window kit yourself. 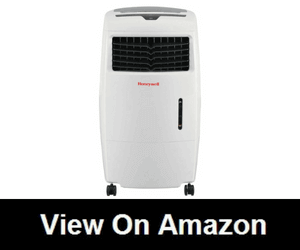 The Honeywell MN Series portable air conditioner has a sleek, modern design cooling and dehumidifying areas up to 450 square feet. With 3-in-1 technology, this portable air conditioner delivers optimum cooling and dehumidiﬁcation. It also has a fan-only function. The full-function remote control allows you to operate each feature from across the room. Unlike a ﬁxed AC, this unit requires no permanent installation and four caster wheels provide easy mobility between areas. Plus, the auto-evaporation system allows for hours of continuous operation with no water to drain or no bucket to empty. This model comes with everything needed including a flexible exhaust hose and an easy-to-install window venting kit. The window vent can be removed when the unit is not in use. Front-facing LCD control panel with a display that clearly indicates the temperature and settings for at a glance convenience. Digital feather touch controls allow for easy pushbutton operation and adjustment of the settings. When used in dehumidifier mode, the unit removes up to 66 pints from the air during a 24-hour period. They like this decent looking and not too heavy to move around a machine, also the controls are easy to use and navigate, the control panel lights up to touch and shuts back off after a few seconds. Enjoy the comfort of a portable air conditioner without the noise and disruption thanks to dual motor technology. You can easily control the temperature and mode from across the room, using the included remote, it also a digital display for simplified use. It has the shortest vent hose we’ve ever seen, which limits its adaptability. The display is a little too bright when it is on. Honeywell Evaporation Air Coolers are an efficient and cost-friendly cooling option for your home. Much like a breeze flowing across a lake or the refreshing cool air you feel near a waterfall. 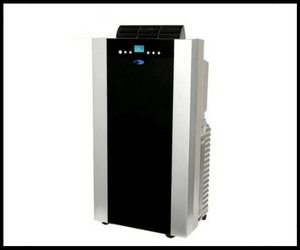 It combines 3 appliances: Evaporative air cooler, fan, and humidiﬁer – into one compact energy-saving system. A fan alone creates a breeze by recirculating warm air, but when you add water and/ice to the tank, Honeywell Evaporative Coolers reduce the temperature of the incoming warm air, transforming it into a cool moist breeze. Honeywell Portable Air Coolers are built to last and carefully crafted with the science of aerodynamics to minimize energy consumption while maximizing the airflow. Ideal for rooms up to 300 square feet, it uses 4 fan speeds and oscillating louvers to distribute cool air throughout your space. The trusted Honeywell engineers created this efﬁcient model, which consumes just 235 watts of power and has an automatic shutoff timer for energy savings. Its 6.6-gallon water tank and powerful fan push cool air through its honeycomb cooling media while a carbon ﬁlter cleanses the air while it cools. This product is liked by many because of its super low power consumption and the moist, cool breeze that can cool you down & be used as humidiﬁcation during winter months. Some love to use it outside as well. Evaporative coolers do not require power hungry components like compressors. The CL25AE consumes only 235 watts of power. This low power consumption translates into signiﬁcant savings on energy bills compared to using air conditioners. Four fan speeds and oscillating louvres improve air circulation and provide an even distribution of cool air for rooms up to 300 square feet. It is not much effective in humid regions. Also, the wheels are not smooth enough to move on a carpet. The Whynter ARC-122DS portable air conditioner is the ideal solution for the warm spots in your home, ofﬁce, server room or other constrained area. 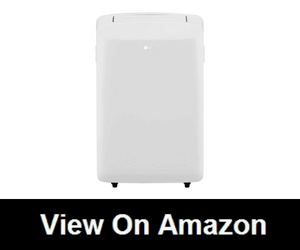 Portable and easy to set up, this portable air conditioner offers cooling relief for any area where excess humidity and heat cannot be remedied by traditional air conditioning. The unit can be easily set up in almost any indoor location and is most commonly used in data closets/server rooms, bedrooms, classrooms and garages or workshops. It portable air conditioner provides 12,000 BTU cooling output while maintaining a compact and portable proﬁle. The dehumidiﬁer mode allows you to extract 76 pints of excess moisture during a 24-hour period. The patented auto drain function fully exhausts all condensate automatically in most environments. It is equipped with an intake and exhaust hose, this system allows for more air intake, cooling power, and constant air pressure, which results in a faster cooling rate compared to the single-hose unit. Its programmable features, operating modes, and an adaptable design make this unit the perfect option for keeping rooms up to 400 square feet cool and comfortable. Everyone is impressed with the performance and the quietness, they say the compressor is extremely quiet and it is even difficult to tell if it’s running or not. The cool thing is that it allows you to set it on a timer to turn on or off if you are at home. A great quality is that it is a small portable air conditioner with its dual-hose system which facilitates better space utilization and more efﬁcient cooling. 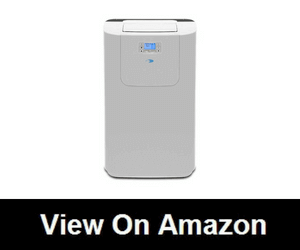 It is also sleeker compared to other portable air conditioners. If you are a first time Whynter product user, then you may find it a little bit difficult when installing your window kit and air conditioner. The unit doesn’t have an option to show the room temperature, all you can see is the set temperature. 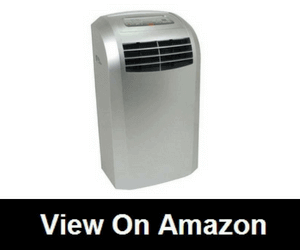 EdgeStar 12000 BTU is a 2-in-1 portable air conditioner and heater for its thermostat can be programmed to temperatures ranging from 61 degrees Fahrenheit to 77 degrees Fahrenheit. It can cover an area of up to 425 square feet varies accordingly to the heat load. The heater functions for a year-round use plus the dehumidiﬁer which function up to 81 pints on every 24 hours. 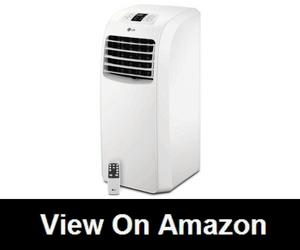 More so, it has a washable pre ﬁlter, one replaceable carbon ﬁlter, and a window kit and extendable exhaust hose included in the package – this portable air conditioner is totally worth it. The thermostat can be programmed to temperatures from 61°F – 77°F and be displayed in either Fahrenheit or Celsius. Washable pre ﬁlter and one replaceable carbon ﬁlter are included. 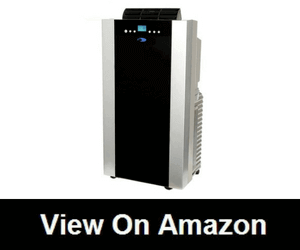 With noticeably lower power consumption rates than other portable air conditioners and a high 10.0 EER (Energy Efﬁciency Ratio), you can run this unit continuously for about a $1 a day. 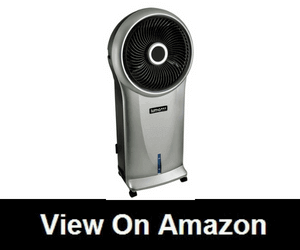 This EdgeStar portable air conditioner and heater are perfect for most people. It’s easy to install, easy to use, does both heating and cooling and easily covers most average room sizes. It might be a bit noisy, but you won’t notice it much during the day. At night, just lower the fan speed for quieter operation. But you’ll probably be cozily asleep in the cool (or warm) air to notice the noise. It saves the energy by setting the unit to run only when you need it, and have it efﬁciently cool your space before you even get there using the 24 hours programmable timer, the timer allows you to set the unit to cycle on automatically, or once it is on, you can set it to automatically turn off. The air conditioner is unable to cool down a room when the temperature gets too warm, the window kit fits the most specific of windows and you are out of luck if you have anything but a single hung. LG’s 115V Portable Air Conditioner with LCD remote control is the ideal climate-control solution for when you’re on the go – room to room, house to house or home to work, the installation is quick and easy. The innovative dehumidiﬁcation function mixes cool dry air with the warm air to keep you comfortable and prevent overcooling. In October 2017, the Department of Energy implemented a new test procedure to determine the BTU rating of portable air conditioners. The procedural change has adjusted the amount of BTUs allowed to be claimed downward by as much as 50%. There have been no internal changes to these units, and the functionality remains the same. The oscillating air vent technology circulates the dispersed air more efﬁciently, so no hot spot will be left untouched. Plus, with the programmable 24-hour on/off timer, you can control the temperature even when you’re not there. The included remote allows you to choose and adjust your comfort settings without having to get up and make the adjustments by hand. 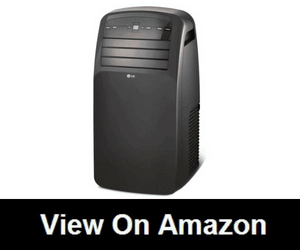 They say this LG portable air conditioner works very well, it is a bit quieter and smaller. It cools down the room just fine and provides enough to regulate the temperature throughout the day. The built-in casters make it easy to move it around your home. The included window installation kit allows for a simplified setup venting the exhaust through a window. Also, the drain plug on the back is in the middle of the unit, this makes it really easy to connect a hose to drain the water from the unit into a container. There are some complains that it leaks water and ruins the carpet and floor. The Luma Comfort EC110S Portable Evaporative Cooler keeps your living space cool and comfortable using patented cyclonic cooling technology. This air cooler’s fan head oscillates and projects a targeted beam of air around your living space so you feel cooler, faster. It is designed to cover 250 square feet, the EC110S is perfect for your bedroom, living room, den or ofﬁce. Since the Luma Comfort EC110S Portable Evaporative Cooler only requires water and electricity, it’s different from an air conditioner and features an earth-friendly design. When used in optimal environmental conditions, this air cooler can drop temperatures by as much as 20° 30°F for just pennies a day. This product is the best choice for hot and dry climates, where the air humidity is low. It works as an air cooler, tower fan, and humidiﬁer, and cools indoor areas using the natural evaporative cooling process. Additional features include an energy-saving timer, high-efﬁciency rigid cooling pad, remote control and digital display. They say that this machine absolutely cools the small and medium-sized rooms, patios and offices, it is conveniently portable and it takes little space. The product has three fan speeds and two operation modes to provide exactly the right amount of cooling for your needs. You can choose to add the included ice pack for addition cold air flow, or you can use the remote control to turn down the airflow when you’ve reached your preferred temperature. The sleek white design of the New Air EC111W looks great with any decor, and it’s easy to move around your home or to carry outdoors thanks to its lightweight design and free-rolling wheels. The water pump is an issue for some people as it has failed just after a few weeks of use. Also, some experienced that the cooler doesn’t work properly and it’s just the fan blowing, and it raises the humidity level. LG’s LP0814WNR 8,000 BTU 115V portable air conditioner with remote control is the ideal climate-control solution for when you’re on the go. With a sleek contemporary design, this freestanding unit blends in with any room decor. The auto evaporation system allows for continuous use without removing any water and with the programmable 24-hour on/off timer, you can control the temperature even when you’re not there. LED display panel with 2 fan speeds and 2 cooling speeds, auto-restart saves your settings for when power is restored to the unit. Easy roll caster wheels allow for easy movement across most floor surfaces. People find this product as a highly effective system that cools and dehumidiﬁes a room within a short time. They say it performs excellently when installing properly. This easy-to-use unit comes with many perks to make you get the most out of it. It effectively cools the room very quickly. Setup is easiest as there is no way it would take you more than 15 minutes to fully set it all up. However, keep in mind that LG suggests that this portable AC is kept upright for 24 hours before turning it on for safety and preventative purposes. It is even considered cheap and affordable especially if you are to compare it to other high-end brands with more or less the same features and capabilities. The exhaust heats up and it can easily warm the air around it, therefore, reducing the overall efﬁciency of the system. To counter this and increase efﬁciency of your unit, we advise you to wrap the hose with an insulator material such as foam. I highly recommend you to read the buyer’s guide before choosing and buying any air conditioner. Here I have described (almost) all those things which you must know about the portable air conditioner. What is required to set up a portable AC? Requirements vary based on the model, but set up is typically quick and painless. Since all portable ACs remove warm air and moisture as they cool, the air has to be exhausted to another location – generally outside through an included window kit. Window kits have a window slider and exhaust hose, which can easily be set up to exhaust warm air outside. The main beneﬁt is the portability itself. Other air conditioners require ﬁxed installations, so they can only cool the room they are installed in. On the other hand, portable air conditioners don’t have that limitation. You can move them from one room to another, most portable air conditioners have caster-wheels to aid you in this process. 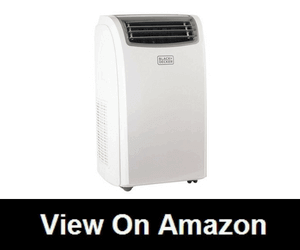 Portable air conditioners tend to be considerably cheaper than similar-capacity window or split units. They are also easier to install and cost less money to install as well. Although portable air conditioners are awesome no dought window air conditioners are also on the way. Here is the brief guide about portable AC vs Window AC. Single Hose OR Dual Hose? A single-hose portable air conditioner draws warm air from your room and cools it down before returning the majority of the air, now cooled, back into the room. A dual-hose portable air conditioner pulls in room air, cools it down, and releases all of it back into your room. The unit uses 100% outside air to transport heat away from the evaporator unit. How to select the correct size? You can ask your real estate agent or developer to help you calculate the room size. They’ll most likely even have the exact room size written down somewhere in ofﬁcial documents. It is not as simple as you may think, you need to be careful about choosing the right portable air conditioner. It takes a lot of patience and some digging to know what exactly you need. Take your time and go through all the information we have provided for you and spend your money on something worthy. Hopefully, our suggestions will help you make a wise choice.